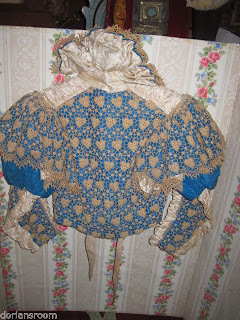 Up for your consideration and offered with NO RESERVE and a special "BUY IT NOW!" 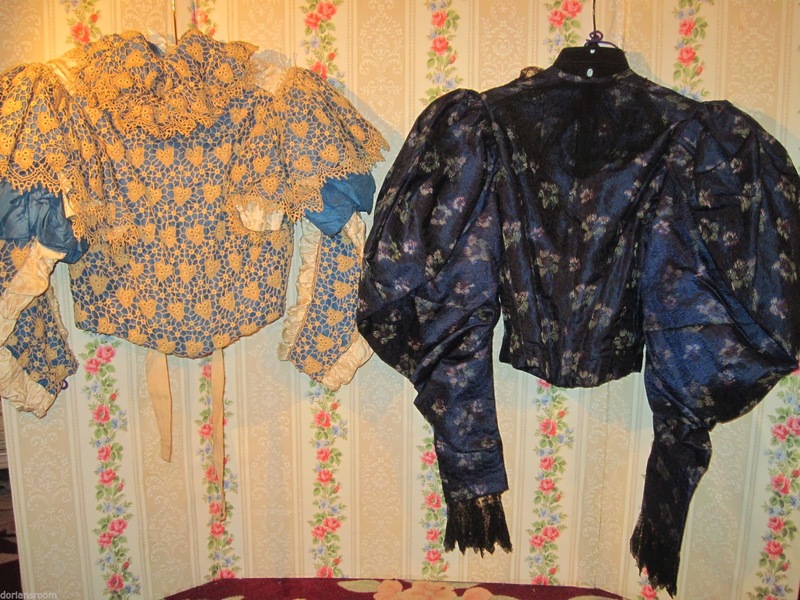 price is an absolutely SPECTACULAR PAIR OF RARE ANTIQUE VICTORIAN LADY'S WAISTCOATS/JACKETS! 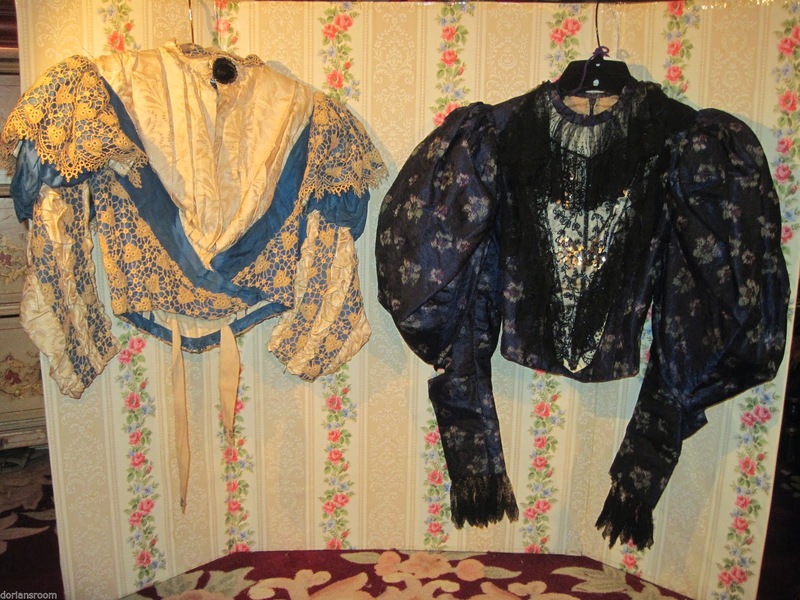 Whether a collector of VICTORIAN EPHEMERA or just love those beautiful ANTIQUE TEXTILES, this wonderful and SUPERB SET would absolutely THRILL the most advanced collector, as they are in AMAZINGLY PERSERVED condition and entirely HAND FASHIONED with the FINEST QUALITY materials! We acquired this set from the SAME COLLECTION of antique lady's garments, where most of the apparel were stored in OLD TRUNKS for safe keeping, and are offering them as a PAIR ONLY for your buying consideration! The set consists of TWO WAISTCOATS; one is made of deep blue floral WATERED SILK with delicate BLACK LACE embellishments, and the other is made of a royal BLUE TAFFETA fabric with gorgeous heavy ecru CROCHET LACE overlay! 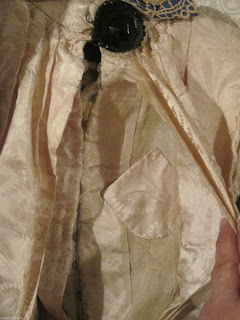 The watered silk jacket measures 16" tall, with 23" sleeves (25" including the lace cuffs), 8" circumference around the cuff, a TINY 21 1/2" circumference around the waist, 13" around the neck, and 10 1/2" across the back shoulders! 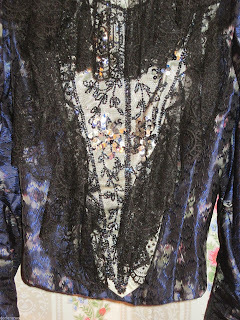 It has many FANCY DETAILS including original black FRENCH LACE dripping from the sleeves, collar and in a "V" down the front of the bodice, gorgeous SPARKLING SEQUINS, and fancy LEG-OF-MUTTON sleeves! 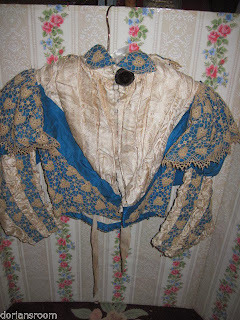 The jacket is FULLY LINED with original WHALEBONE STAYS, and opens in the front with HOOK & EYE enclosures where the front bodice overlaps for a very FITTED look! 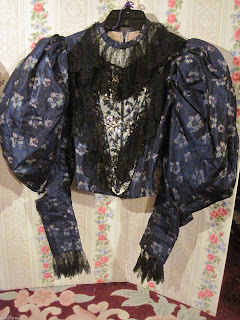 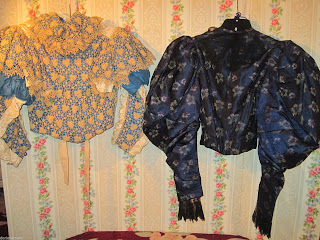 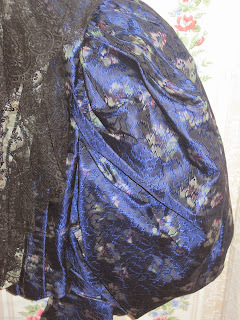 The blue tafetta and lace jacket measures 14 1/2" tall in front, 16 1/2" in back where the jacket is longer in the center, has 16" long sleeves with 9" circumference around the cuff, a 23" waist, 10 1/2" circumference around the neck, and is 11" across the back of the shoulders! 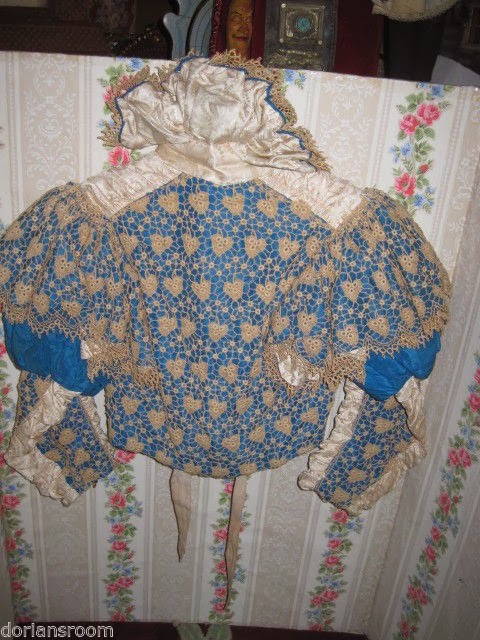 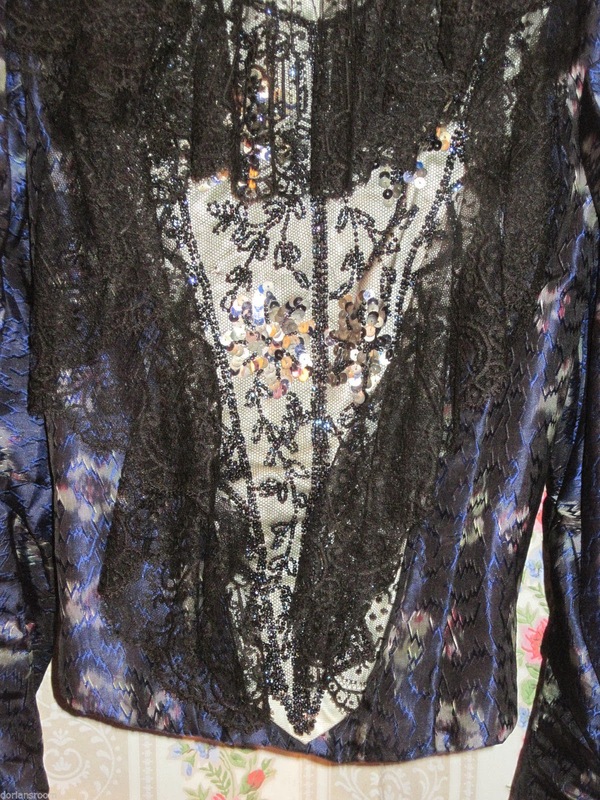 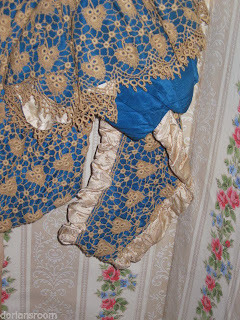 It also has GORGEOUS HANDWORK including original contasting ecru CROCHET LACE over the darker royal blue taffeta fabric, cream RUCHED SILK panels down the sleeves and under the collar, cream PLEATED SILK in a "V" shape down the front of the bodice, wonderful large decorative JET BLACK glass button, and puffed LEG-OF-MUTTON sleeves! The jacket is also FULLY LINED with white muslin material and original WHALEBONE STAYS, opening in the front with original HOOK & EYE enclosures! 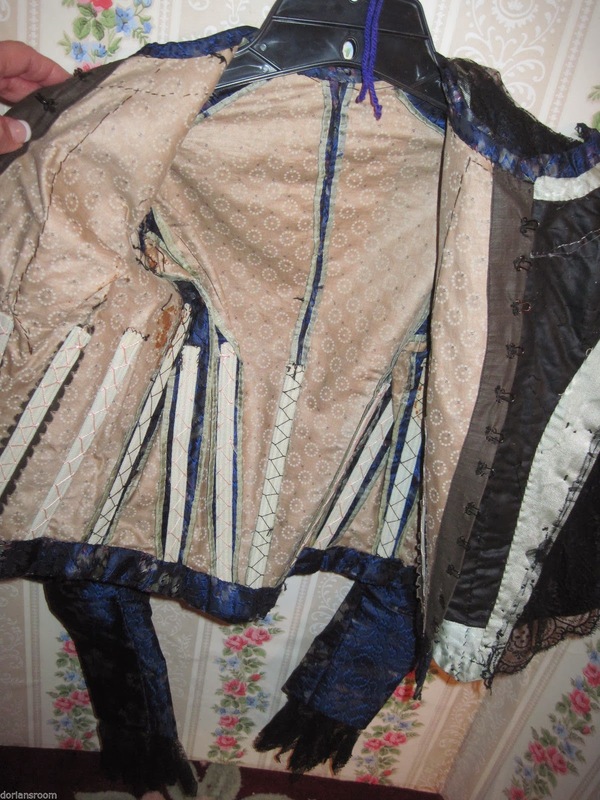 Considering their age, the jackets are in overall almost MINT CONDITION, with very little wear to the fabrics and the colors still VIBRANT! What an EXQUISITE DISPLAY this pair would make hanging from the wall of a VICTORIAN BOUDOIR, or perfect showcased with your larger ANTIQUE DOLLS! 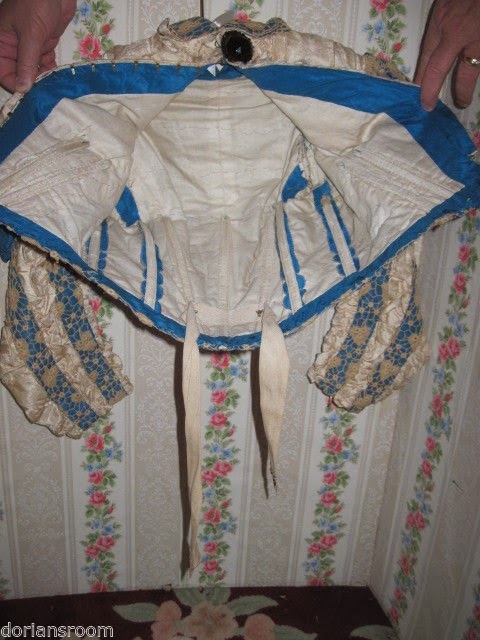 If it weren't for the measurements, I'd think they were for dolls based on the one picture with the seller's hands and the bodice. However, these were probably young lady (teenagers) bodices.